Did you know that we can use the power of ocean waves to generate electricity and fresh water? At UC Berkeley we are developing a new Wave Energy Converter that is able to efficiently harvest this energy. The design was inspired by the ability of muddy seafloors to effectively absorb overpassing ocean wave within only a couple of wavelengths. 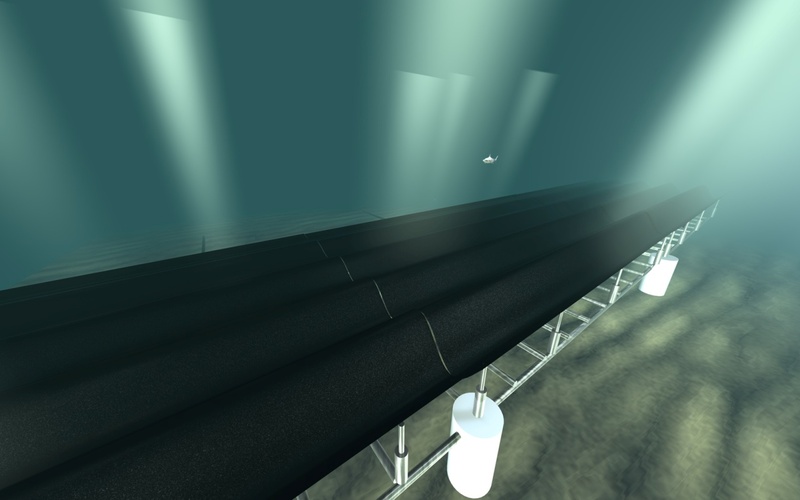 Our design uses a synthetic-seabed-carpet that is connected to a grid of generators underneath, that has the ability to extract wave energy the same way the muddy seafloor does. We successfully demonstrated its capability to absorb and convert wave energy for multiple sea states. The ability to cancel waves can be used to create safe zones in the ocean, prevent erosion and protect harbors. Secondly, the CWEC’s primary energy conversion creates seawater at high pressure. This can be used to generate electricity, be used for desalination and for the distribution of fresh water. High pressure water can supply pumped-storage hydroelectric power plants, which are the most efficient way to balance the electrical grid. World-wide demand for electricity is expected to double within the next 20 years and thus, one of the major engineering challenges of the 21st century is to meet the constantly increasing global energy demand, especially on the coastlines, as migration is likely double the population in this area by 2025. The ocean is a large, relatively untapped renewable energy resource. The British Department of Trade and Industry has claimed that there are at least 90 million gigawatts of energy in wind driven waves alone worldwide. This may be compared to the 15 thousands gigawatts of energy consumed worldwide. According to London-based Carbon Trust, wave energy can realistically provide over 2,000 terawatt hours (TWh) of electricity per year approximately 10% of global electricity needs and eventually generate revenues from wholesale power sales in excess of $50 billion per year. However, according to the Electric Power Research Institute (EPRI) of Palo Alto, CA, a realistic estimate of ocean wave energy potential in the United States indicates approximately 6% of total energy needs with a wholesale market value eventually reaching $16 billion per year. Although still in the early stages of development, wave energy can and will provide enough power to supply a substantial part of the world energy demand. The wave energy industry is sometimes compared with the wind energy industry some 25 years ago when there was neither a unique design, nor a universal agreement on its future path. Wind industry has converged to a unique design over the past quarter of a century and now is a major player in the energy industry. Having learned from the evolution of wind power, wave energy is expected to come into play in a much shorter time period. The ability of muddy seafloors to dampen ocean waves is well documented at various locations around the world. In the Gulf of Mexico, fishermen have learned to steer their boats into a local muddy spot known as the “mud hole” when a storm is brewing. Here, the wave–mud interaction is so strong that the storm waves are damped within a distance of a couple of wavelengths (100–200 m) and the boats there are completely safe. If mud can seriously take so much energy out of ocean waves, then why don’t we use this idea to design a wave-energy converter that’s very efficient? We came up with the idea of using a viscoelastic carpet of wave-energy conversion (CWEC) placed over a network of vertically oriented springs and generators on the coastal seafloor. The flexible carpet responds just like mud: as waves pass overhead, they induce dynamic ripples and undulations in its sprung surface, and these perturbations can be used to generate electricity. The principle components of the prototype consist of a synthetic seabed carpet, a direct physical connection, a hydraulic Power Take Off system and a mooring system. 1) Schematic of a synthetic viscoelastic carpet on the seafloor for extracting energy from surface gravity waves. 2) Abstract model of components. 3) Mechanical model. Here at UC Berkeley, we are working on a novel design to harvest Wave Energy economically and reliably. In our wave tank laboratory, we have developed a proof-of-concept-prototype and have successfully tested the functionality and ability of the converter to cancel waves and generate power. The concept has been investigated theoretically and numerically for linear and nonlinear regimes. It has undergone extensive experimental study at our wave tank laboratory. Experimental set up while operating with 3 PTO units. The PTO are double acting reciprocating piston type pumps. The energy stored in overtopping waves is damped out by the absorber carpet and converted into hydraulic energy using double reacting reciprocating pumps which are connected to the carpet. The engineering challenge of an absorber carpet material with anisotropic material properties was addressed by using a composite material. The carpet material required a low Young’s modulus in its horizontal direction and a high bending stiffness in its vertical direction. The results of the experiments conducted are first data sets for the absorption and Power Take Off (PTO) efficiency while operating under the influence of several sea states. High survivability – Due to the fact that the carpet is seabed-based, it is able to survive the strong momentum of stormy seas. Material Durability – Flexible non-corrosive material. Transportability – The system is easily moved and brought to the ocean without requiring high maintenance costs. Efficiency – Ability of high, broadband and omnidirectional absorption efficiency. Scalability – The modular design allows the device to scale in width for setting a desired output power capacity. Hazardless – The device poses no visual pollution to the ocean surface and no collision danger to boats and sea life. Visual impression of the large scale power plant in the ocean. Our long term goal is to tap the abundant and unused resources of ocean wave power in order to contribute to the RE mix and thereby meet the future’s growing energy demand in an independent and sustainable manner. An essential step towards this goal is to fully proof the functionality of a pilot plant in the ocean.